St. Andrew’s College has long been committed to ensuring our boys learn how to engage appropriately with others in the community so that they can develop healthy, meaningful, and sustained human relationships. Our programs are rooted in core external and internal policies that speak to the necessity for schools to be inclusive and to enact proactive approaches to interrelationships. The internal policies that drive these initiatives at St. Andrew’s include, but are not limited to, the SAC Mutual Respect Policy, the Parent & Student Handbook, and our Strategic Plan; external policies include OS 2016 and PPM 119, 128, and 144. Programmatically, the School leverages a myriad of in-school opportunities, driven by the School Life Team, including Chapel, Advisory, assemblies, and special events to promote programming specific to inclusivity. Complementary to these programs is our Health and Wellness Centre,which seeks to provide boys with support as they encounter challenges in their daily life. The Middle School program is unique in that its focus on Guyship ensures students learn these values early in their Andrean career. St. Andrew’s College promotes responsibility, respect, civility, and academic excellence in a safe learning and teaching environment. All students, parents, employees, and directors have the right to be safe, and feel safe, in their school community. All members of our community have the right to expect that St. Andrew’s College will take steps to create an environment of mutual respect. Any form of discrimination, harassment, violence, bullying, or abuse is prohibited. The College will take all complaints seriously. The College commits to timely investigations that are thorough, objective, and fair to all affected parties. Every person has the right to report an incident or suspected incident without fear of reprisal. The Mutual Respect Policy falls under the umbrella of our Code of Honour and Code of Conduct, located on page 65. The disciplinary consequences for mutual respect infractions can be found on pages 76-79 of the Parent & Student Handbook. AI5: Explicitly embed the themes of compassion and empathy into our programs such that they become motivators in our boys’ life choices. AI6: Implement a curriculum both within and outside of the Academic program that helps boys understand constructions of masculinities for the purpose of providing awareness and opportunities to address the various healthy and honourable ways to be a man in contemporary society. HW2: Increase our support for mental health and counselling services to ensure proactive education for students and also mental health case management. HW3: Clearly identify the role Chapel and spirituality play in the life of students. With an eye on tradition, create a Chapel program relevant to boys and their needs. Chapel will focus on school values, an awareness of social justice, character, citizenship, improving the world, inspiration, resiliency, and perseverance through intentionality. Chapel will be a space to address religion, spirituality, and mindfulness and increase the connections within our community. HW6: Develop a programmatic and systematic approach to educating our boys on appropriate, positive, and healthy relationships with young women. This should include both personal and electronic communications. Creating, fostering, and sustaining healthy, safe, and accepting learning environments is essential to the positive cognitive, emotional, social, and physical development of learners and contributes to their well-being and learning. Actively promoting and supporting positive student behaviour, relationships, and healthy living through a whole-school approach will foster positive school climates in which all members of the school community feel safe, comfortable, and accepted (1.1). A school should be a place that promotes responsibility, respect, civility, and academic excellence in a safe learning and teaching environment. A positive school climate exists when all members of the school community feel safe, included, and accepted, and actively promote positive behaviours and interactions. Building and sustaining a positive school climate is a complex challenge requiring evidence-informed solutions. The purpose of this memorandum is to provide direction to school boards on the review, development, implementation, and monitoring of equity and inclusive education policies to support student achievement and well-being. Our schools need to help students develop into highly skilled, knowledgeable, and caring citizens who can contribute to both a strong economy and a cohesive society. Bullying is typically a form of repeated and aggressive behaviour directed at an individual or individuals that is intended to cause (or should be known to cause) fear and distress and/or harm to another person's body, feelings, self-esteem, or reputation. electronic (commonly known as cyberbullying) – spreading rumours and hurtful comments through the use of email, cellphones (e.g., text messaging) and on social media sites. What is electronic bullying or cyberbullying? Comprised of members of the senior administration at St. Andrew’s, the School Life Team works collaboratively to promote a safe, positive, inclusive, engaging, and thoughtful environment for its students. The team dedicates itself to all facets of school life, including student engagement, discipline, and pastoral care. The monthly themes are significant to the well-being, growth, and development of the students of St. Andrew’s. Chapel curriculum follows monthly themes that are decided upon by the Student Life Team and supported by the Chapel Council, a group of senior students who support the mandate of the Chapel and are instrumental in its relevance. The service includes the singing of a hymn, an interactive conversation, and a moment of reflection. Faculty and staff are invited to participate in the “Stories of Us” program, while the Music Department invites musicians to add accompaniment to our time of reflection. The Advisory program has a dual purpose. Its first role is to support the cognitive growth of an advisee and support him through the rigours of the Academic program and to lend assistance in any way he/she can in supporting the advisee through coursework obstacles and dealings with teachers. The second role involves guiding the student’s growth through an educational and thematic program that focuses on the effective growth of the student in areas outside the academic stream. The Advisory program aims to foster pastoral care within each group and helps students to not just attain their academic goals but become more well-rounded through the character education discussed at the weekly meetings. The Friday advisory meetings discuss the Chapel topics from earlier in the week. The Advisory program at St. Andrew’s functions to strengthen and support young Andreans and allow them to more fully realize their potential to become ‘the complete man, the well-rounded citizen,’ where success is measured equally by personal growth in the areas of a healthy mind, heart, spirit, and body. Once a week, the Upper School comes together for special announcements, an overview of the week’s activities, and a chance for clubs to showcase their work. The School Prefects run the assembly and they are an important part of the weekly student life events. Clubs at the School like Social Justice, Jack.org, SAC TV, and the Chapel Council use this time to promote their club’s activities and help to reinforce the theme of the month. At the beginning of the month, the theme is introduced to the students by citing real-world examples. Saints Day: Marathon of Sport in support of motionball. The staff in the Health and Wellness Centre take care of the needs of all the students of St. Andrew’s. There is a full-time nursing staff on during regular school hours and a nurse on call 24/7. Three days a week, a local doctor and counsellor will see students. Building boys of high character is a top priority, and one that begins during the middle years at St. Andrew’s College. While we recognize that a ‘bully-free’ environment is nearly impossible to achieve at any school, we understand the importance of establishing a proactive atmosphere that reinforces messages of strong character development. 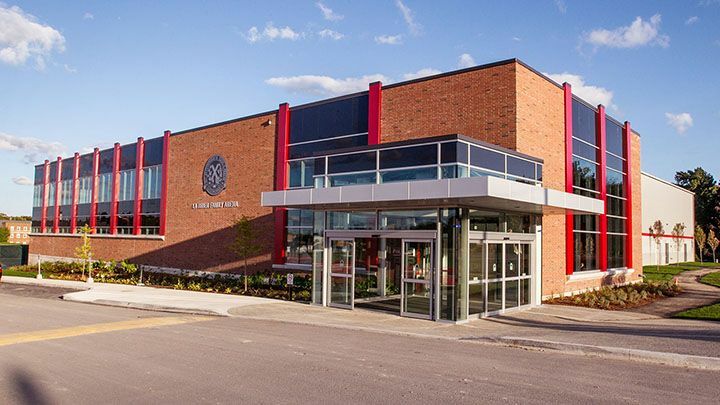 The Middle School provides many educational opportunities for its students to be aware of the type of behaviours that are considered bullying or harassment – neither of which is tolerated at SAC. Messages of this nature are often brought forward through the Middle School Advisory program. Positive character development can be seen through a number of anti-bullying and other character building initiatives. When working with adolescents, we expect that challenges will arise. It is for this reason that we have a Mutual Respect Policy. We recognize that to achieve our vision, the environment we provide must be one which demonstrates respect, dignity, equity, and safety for all members of the Andrean community. In order to excel in all areas of school life, all members of our community need to feel safe in the School and have the right to expect the School to take steps that create an environment of mutual respect. The Mutual Respect Policy allows students to discuss issues that may be troubling them with a faculty facilitator. Currently, we have one faculty facilitator for the Middle School. The facilitator acts as a coach to the student and recommends a direction the student should take. Typically, issues that are brought forth tend to be minor in nature and are guided to resolution with the aid of the facilitator and student(s). We are proud to offer members of our community an opportunity to disclose feelings of hurt, frustration, or discomfort while striving for an understanding of mutual respect and supporting the School's mission, “Dedicated to the development of the complete man, the well-rounded citizen.